Alma – One day we will be in charge 2013-07-16 15.31.48, a photo by janholmquist on Flickr. This is one my favorite photos. My daugther Alma found a stone near the Berlin wall – East side gallery on our summer holiday this year – She was sure it was from the remains of the wall. It had a slight blue tone – and she held it to this painting saying she found the spot where it did fit.I took this picture and later I saw the writing on the wall ” One day we will be in charge”… This makes me happy and full of hope. Alma sure does make this world a better place. I have been thinking about and practicing more unplugging from social media lately. I am busy at work and I value my network in my spare time. What I learn from people on twitter is hard to overrate – but most important to me is being present with whatever I experience and the people I find valuable. Unplugging from technology focuses my attention to where it is supposed to be at vacation time – with my wife and wonderful son and daughter. Rule: max 45 minutes of social media a day: Twitter that is. No Facebook or G+ – at least a week of total unplugging. I save an awful lot to read later at InstaPaper. I must learn to save less and read more. For summer reading I will focus on InstaPaper and read a lot of valuable stuff waiting for me there… And in the future I will be more brutal when I hit “Save to InstaPaper”. I will lay in the grass and look at the clouds – If weather permits. When I cycle I will send warm thoughts to the awesome library unconference Cycling for Libraries – If you want to re-read what happened when they visited my library last year – Here’s a link for you. Summer vacation time is a bit like New Year – but the weather is better. I’ll make “walk and think” appointments with myself to set personal goals for the rest of the year. I will also take some time to clear my mind. Practice mindfulness 20 minutes a day – Without falling asleep that is! 🙂 – I will be Zen-ish! I am very happy to be able to share my thoughts about global librarianship over at Jessica Olin´s great blog “Letters to a Young Librarian”. I hope you will take the time to visit Jessica´s blog and read my post – Comments very welcome. 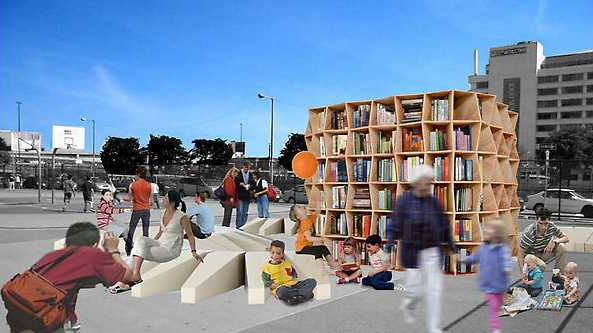 Imagine having the possibility to move the library learning space outdoors to meet the people, creating a place for learning, being inspired and making connections in the community. That is just some of the things The Uni will make possible. I think it is impossible not to be inspired by this but go to the website and see for yourself and learn more about this great project. You can help fund the project if you want, but looking and learning is free. How did the Uni inspire me: We are constantly looking for ways to connect with the community by bringing the library where the people are. The design makes an open outdoor space for learning and connecting. It’s an opportunity to make “instant library”. I want that! I can imagine it moving from city to city or from country to country promoting libraries by being awesome. How it inspired me: This got me asking the questions: We try to reach non-users of the library all the time, but are we doing it right? If we invited the taxi drivers or hairdressers of the community to an Info-event at the library, what would be the right way to inspire them to inspire others? How it inspired me: Follow your dreams and ideas… How much stuff do we need in our lives? This guy makes the most out of a few square feet. How will we make the most out of what we have, focus on the important and make inspiring libraries with the many square feet we have? Also How will we focus on what is important in our lives? Thank You Meredith – For sharing.